Zion Market Research has published a new report titled “Defoamers Market (Water Based, Silicone Based, Oil Based, and Others) Paper & Pulp, Paints & Coatings, Water Treatment, Food & Beverages, and Other End-user: Global Industry Perspective, Comprehensive Analysis, Size, Share, Growth, Segment, Trends and Forecast, 2015 – 2021”. According to the report, the global defoamers market was around 4100-kilo tons in 2015. 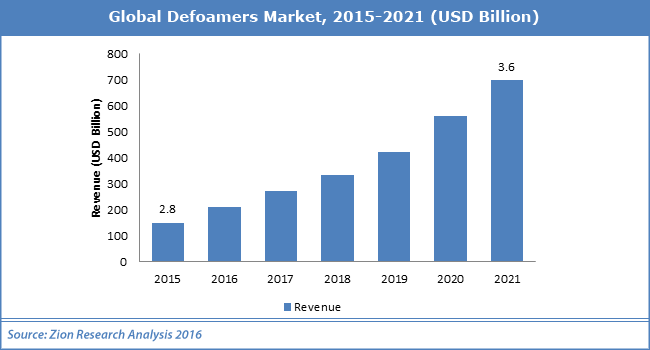 The global defoamers market revenue accounted for approximately USD 2.8 Billion in 2015 and is expected to reach approximately USD 3.6 Billion by 2021, growing at a CAGR of around 4.3% between 2016 and 2021. Defoamers help to reduce and hinder the formation of foam in industrial process liquids. Foam is a substance which is formed as a result of trapping pockets of gas in a liquid or solid. Foam blocks the transfer of oxygen from air and hampers the flow of liquid. Thus, the formation of foam affects many industrial processes. Defoamers are insoluble in the foaming medium and have surface active properties. An essential feature of a defoamer product is a low viscosity and a facility to spread rapidly on foamy surfaces. Thus, the defoamer is used in multiple end-user industries where the formation of foam possesses the significant threat. Increasing demand from paper & pulp industry especially in Asia Pacific region is expected to drive the demand for the defoamers market during the forecast period. Moreover, increase demand from food & beverages and paints & coatings end-user industries are some others factors driving the growth of global defoamers market. However, stringent regulations on VOC containing defoamers, and concerns regarding the health problems that they cause may curb the defoamers market in the near future. Nonetheless, growing demand for defoamers in Asia Pacific region is expected to open new avenues for the market over the years. Silicone based defoamer is one of the major types of defoamer used globally accounting for more than one-third of the global defoamers market share. While, water based defoamers are expected to be the fastest growing segment during the forecast period. Paper & pulp industry dominated the global defoamers’ market share in 2015. Waste water treatment is expected to be second largest end-user industry for global defoamers market. Asia-Pacific was the largest regional market for the defoamers in 2015. Asia Pacific accounted for more than 30% share of global defoamers market. Europe followed Asia Pacific in terms of demand for defoamers globally. However, strict regulations concerned with the use of VOC containing defoamers are impeding market growth in this region. Moreover, sluggish growth of paper & pulp industry in this region is expected to hamper the growth of defoamers market in this region. Asia Pacific is expected to be the fastest regional market for defoamers due to large consumption base, the growth of various end-user industries, and lenient governmental regulations. Countries such as China, India and Japan are predominantly contributing to the growth of defoamers in this region. North America is expected to witness moderate growth. Latin America is expected to witness noticeable growth, while the Middle East & Africa is estimated to expand at a slow growth rate. Key players operating in the defoamers market include Wacker Chemie AG, Bluestar Silicones, Elementis plc, Clariant, KCC Basildon, BASF SE, Dow Corning Corporation, Air Products and Chemicals, Inc., Ashland, Inc., Kemira Oyj, and Evonik Industries AG among others.